I’m finding it a little hard to believe we’ve already come around to another Secret Recipe Club posting, because that’s supposed to mean that another month has gone by. Surely that’s not the case, right? When it came time to choose my recipe from Everyday Mom, I took my time, looking through lots of old posts – even from last year. I like that Kim involves her kids in the kitchen, and isn’t afraid to throw out the crazy last minute ideas she sometimes has for dinner. Stuff to keep her family well fed and happy, even in crunch time. Like this Stromboli. 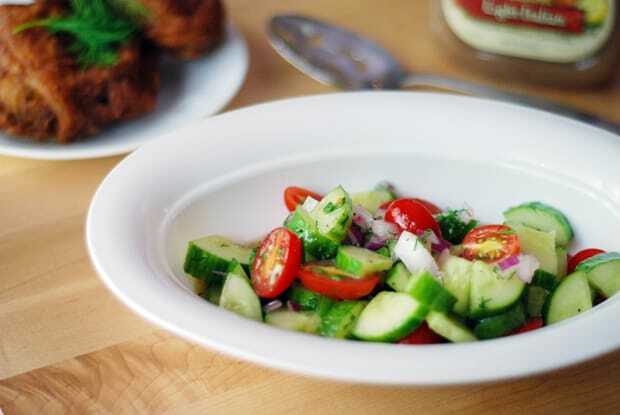 As Kim says, “I am a fan of anything that hides some of its ingredients and allows the use of those random bits of food that you have leftover at the end of the week. This week we had some marinara sauce, one uncooked chicken breast, a head of broccoli and some mozzarella”. That is exactly how I approached the stromboli I made for The Brit and me. We had some mushrooms in the fridge on their last legs, and what I knew would be a few extra sausages from our favorite grilled sausage and maple polenta meal that I already had in the weekly dinner plan. Add in some marinara and mozzarella, and as far as I’m concerned, you’ve got a party. I’d also been meaning to try this Olive Oil Dough of Jamie’s for ages now. Though, a word to the wise, guys: When you’re getting a headcold, and find it hard to focus entirely on something? It might be a good idea to have a partner-in-crime double check your ingredients. Jamie’s recipe called for 1/4 cup of olive oil. I misread and added 3/4 cup! I saved the dough, but it took an additional three cups of flour! A lot of people don’t know that my very first job at the age of 15 was in a little family owned pizza place. Making the dough and then the stromboli brought back so many memories for me of that first job. The smells, the feel of the dough in my hands, and in the end, the gloriously delicious smells coming out of my oven! Kim, thank you so much for the dinner inspiration. I hadn’t made stromboli in years, and we’re definitely going to be making it a lot more often around here. Both of us truly enjoyed this old favorite, and The Brit is excited for his lunch leftovers for a change! Dough adapted from My Baking Addiction, by complete accident! First, prepare the dough. Either by hand or using a stand mixer fitted with a dough hook attachment, combine water, yeast, salt, sugar, and olive oil in a large bowl. Mix well to combine. Add flour, a few cups at a time, and allow to fully incorporate before adding more flour. Once dough is cohesive (but sticky), place in a separate greased large bowl and lightly cover (not airtight) for at least 2 hours. Per Jamie, “Dough can be used immediately after first rise, but is easier to handle when cold”. Once the dough is ready to go, preheat the oven to 400F. If you have a pizza stone, place it in the oven now. In a large skillet, heat olive oil. Add sausage filling, chopped mushrooms and shallot, and minced garlic. Allow all items to brown before adding any salt, pepper, or oregano, as salt will bring out the moisture in the mushrooms and they will not brown properly. Remove from heat when chicken sausage has cooked through thoroughly and you have a nice brown color on the other ingredients. Spread a layer of flour onto a clean and dry surface. Using one loaf, roll out into a large rectangle with a rolling pin. When dough seems evenly rolled out into a rectangle of about 11″ x 17″, spread the tomato sauce evenly, leaving about a 1/2 inch border around each edge of the rectangle. Spread the filling across the sauce, then cover with mozzarella. Roll dough up and press firmly on the top to create a seal. Tuck ends under the loaf. Drizzle or brush olive oil on top of the stromboli, then sprinkle with salt, pepper, oregano, and Parmesan cheese. Place the loaf on a parchment lined baking tray or directly onto the pizza stone in the oven. Bake for approximately 40 minutes, or until the crust is golden brown. Slice using a bread knife. Each stromboli makes about 6 1 1/2″ pieces. Looks great…. am definitely going to try this one! This looks so good, I’ve never made stromboli before, I can’t wait to try this out! I can see this could be come a family favorite. Pinned it easy reference. WoW i have not have stromboli in years – i can’t even remember when i had it last. But this looks amazing. I now know what i am making for my next dinner party. Fabulous.! 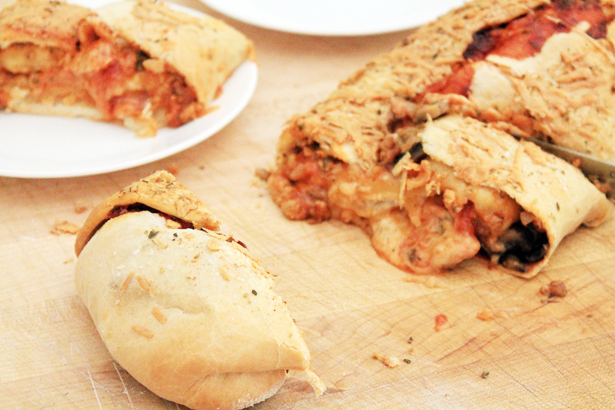 Mmm I love stromboli – and I love the idea that you can throw in whatever you have handy! OMG my mouth is watering! I haven’t made Stromboli in a couple of years, thanks for the reminder! I love stromboli! These one looks amazing! What a grea tpick for SRC! Love how both pizza and stromboli lend themselves to using up the randoms hanging out in the fridge. They are one of our favorites in our house! 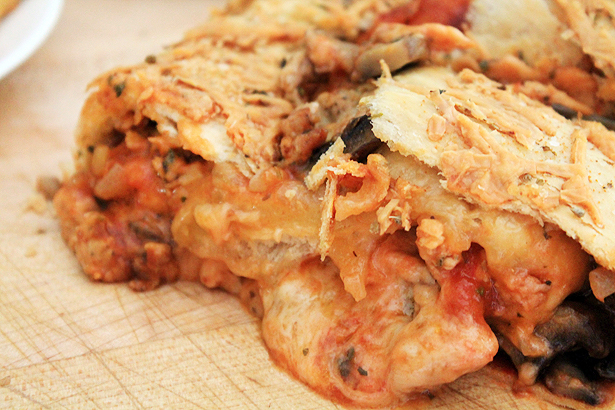 This looks like the true example of an Italian stromboli! Love that picture of all the filling with the crispy wrapper..I love pizza and this is the next best thing. I never saw this original recipe and I am glad you chose it for SRC. I have saved this recipe. Buzz! My husband has been asking for stromboli, now that I’ve seen yours I’ll have to give it a try. Lisa, I did see your post, and left a comment. It’s great! I just saw your comment, thank you so much for your kind words too. I love when I go out and read all the posts until I find the blogger who made something from my blog instead of reading the comments on my blog first so I’ve been out checking out all the wonderful recipes. Off to see more posts and decide what to make for dinner. So now you just have lots more dough for oozy strombolis – holy crapoly, does that picture look good. I seriously want to invest in smell-o-vision for the interwebs.